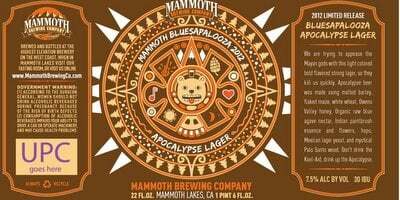 Mammoth Brewing Co. announced the release of its limited-edition craft beer, “Bear Garden.” Complementing the four-day annual Bluesapalooza festival (July 31–Aug. 3), which includes more than 80 craft breweries and performances from more than 20 popular bands, the Mammoth Brewing Co. brewers create an original beer to be sold at the festival —a tradition that began in 2007. Head brewer Jason Senior chatted with Craft Brewing Business (CBB) about the inspiration behind a limited-availability brew and the innovative process from which “Bear Garden” and other past exclusive craft beers from MBC were engineered. We also spoke with co-owner Sean Turner about the business behind limited-edition, special-event craft beers. CBB: What, if any, complications arise from brewing a small batch, but keeping up with regular production? Jason: The only real complication is not maximizing our tank space and therefore losing a bit of production. Instead of 30 bbls of beer taking up a tank, we have only 15 bbls. We just have to plan for it. Getting to brew small batches is well worth the extra planning, though. CBB: What goes into the process of deciding on the style and ingredients that are used? Jason: I usually call a brewer’s meeting where the Brew Crew will sit down and talk about what we want the beer to taste like and what ingredients and/or techniques will get us there. We will taste various beers of different styles, create infusions, and mix beers to more finely hone the flavors we want to end up with. After that, I will sit down and write up the recipe and brewing plan. Then the crew will brew it up. Each small-batch beer has a unique inspiration. We are a mountain-living-driven company, so most of the inspirations come from the backcountry. The “IPA 395” was born from the aroma of wet sage after a thunderstorm, the “Wild Sierra” from chewing on piñon pine needles while hiking with the dogs. The “Lair of the Bear” was nighttime backcountry snowboard runs with the blackness of night and brightness of the moon bouncing off the snow; we needed something dark and powerful. And the adventure continues with “Bear Garden,” created from something as simple as smelling the flowers while mountain biking down Lower Rock Creek trail. The outdoors is a way of life in the Eastern Sierra and we strive for our beer to emulate that. CBB: From a brewing strategy point of view, what does an exclusive, limited-run craft beer mean to the company? Sean: It allows our brewers to constantly be innovative and creative! This is the fun part of what we do; making limited-run beers allows us to experiment with unique ingredients and brewing styles. One of the best things about our small industry is that we all are challenging each other to produce new styles and flavors. Limited runs are the best way to do this. CBB: Seasonal and limited-run beers are a big trend in craft beer. How does the brewery’s marketing side balance seasonal/limited-run demand while still supporting its go-to beers? Sean: We always take great pride in the consistency of our “go-to” beers, and they will probably always be the bread and butter of what we do as a professional brewery. Our customers have come to expect a consistent flavor in our core styles. However, being able to offer a seasonal/limited series of beers on a regular basis that are always new and exciting is what gets us unique attention and publicity. While these styles may represent a small percentage of our overall sales, they will command a large portion of what defines passion and commitment to experimentation in this company. And doing it for such a great event like Bluesapalooza, which celebrates the coming together of craft brewers from all over the country, is a perfect time to create these unique beers! CBB: How does supporting a local event like this benefit the brewery? And how does the brewery go about selecting the right event? Sean: Hosting an event like this is great for promoting Mammoth within our local community. The Mammoth public loves having an influx of brewers and tourists. We dramatically help the local community by creating an annual mecca for craft-savvy brewers and consumers. It’s also great for the brewery to be hosting so many other brewers who share our passion for making great beer. Bluesa is one of the longest-running events and most popular festivals within Mammoth Lakes, and we allow only craft brewers to attend. This is because we are a brewers’ festival and within the industry we have a lot of respect. We’re a destination resort and brewers enjoy turning the weekend at Bluesa into a well-deserved getaway for their employees. For this year’s festival we have 83 brewers attending and had to turn down 35 brewers due to lack of space. As a result, next year we will go to “invitation only” by necessity. Events can really generate excitement around the brewery and give us opportunities to share our passion with the local community. Future events for us include “Hop ‘n Sage” on Sept. 6, 2014 — a beer-release and harvest festival promoting brews made with indigenous ingredients.